A heavy duty tire that won't weigh you down. 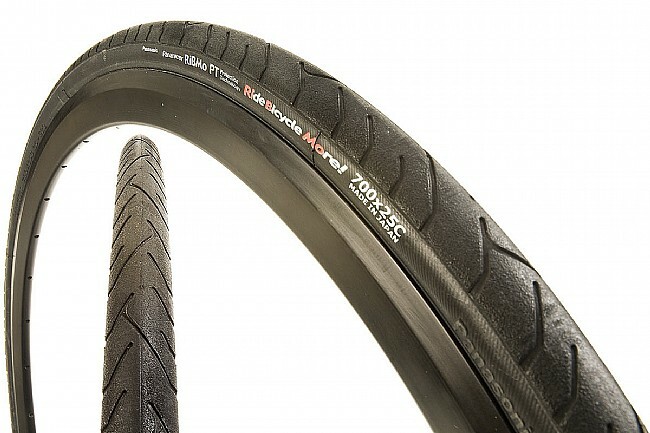 The RiBMo (Ride Bicycle More) steps up the puncture protection over the popular T-Serv model with a harder wearing tread and only a few grams of additional weight. Perfect for urban riding or performance oriented touring. I have been riding these tires daily for two years with only one flat. Bombproof commuter tire! These are my non-snow tires for commuting. I ride the 35s because big and cushy is nice, and have been happy. 19 miles a day, no flats yet. I agree that they are not as supple as a training tire might be - the penalty for flat resistance. The ovoid tread profile is a little funky, but I see it as more rubber between my tube and road debris. My new bike came with Panaracer RiBMo front and back. With my previous bike, fitted with Primo tires, I'd been getting a flat once every two or three rides. Compared to the Primos, the RiBMo is a slow tire - like a couple miles per hour slower. On the flip side, though, I've gotten one flat in dozens of rides, and that was from a nail (as opposed to a sticker). I'm slower on the road, but I'm no longer spending a half-hour every third ride fixing a flat. These tires are a great deal and great quallity! Tires stick to the road well. Nice and fast. I ride several miles a day in LA city streets and have had no punctures or flats. I had gator skins previous to these and wasn't that impressed. I'd recommend to anybody. I wrote my initial review of this tire with glee at my lack of flats, the reason I initially purchased the tire. After 600 miles, I will say that their rolling resistance is NOTICEABLE to put it politely. When I wrote my initial review, I thought it was in my head and probably just the cold weather or just the rain or just a result of my winter training weight. It wasn't. They just have a lot of rolling resistance. But I didn't buy them as a race tire so I wouldn't expect anything different. I didn't get a single flat and they kept me on the road as I had hoped. I ride and love my Conti 4000s through the clear weather here in Portland, Oregon. When Fall comes, the roads provide more debris and flats became all too common on my training rides. I go crazy riding indoors on my rollers and need a tire that I can ride with confidence through the Winter. I considered the Conti 4 Season, but read so many mediocre reviews that I decided to give a less expensive unknown a shot. I switched to the RibMo a week ago. I couldn't be happier. Correction, I would prefer a different name - RiBMo is an acronym for Ride Bike More. They were very difficult to mount initially, but I have read that after being mounted, they go back on easily. (Hopefully, I will take them off in the Spring after a winter without flats and not remount until next fall) After about the initial 40 miles, this tire really breaks in and no longer feels as sluggish. They do have more rolling resistance than my Conti 4000s, but I would be an idiot to expect anything different. I can now ride in any weatherroad condition with confidence. The tire lives up to its stupid name and helps get me out of the house on cold, wet days.